please visit Third World Debt (1999-2000), more debt (2000), march debt ( this page 2000-2001) and 2005 Debt. Great steps forward were made, but the fight against poverty continues. "Bono Are you ready for the dancing portion yet?" LONDON May 29, 2002 -- A precedent dating from the 19th century is to be used by debt activists in a new push which they say could result in up to half the $2.4 trillion owed by some of the world's poorest countries being declared illegitimate. Coinciding with a high profile trip to Africa by rock star Bono and US Treasury Secretary Paul O'Neill, campaigners hope to build the sort of public pressure which has wrung $34.5 billion in debt relief from rich countries for poor nations. The doctrine they hope to use, that of "odious debts," originated in 1898 when the United States said the people of Cuba and the US were not liable to pay debts incurred by Spain in a war with the US over the island. Campaigners now hope to use the doctrine to re-examine issues such as the legacy of apartheid-era debts in South Africa and loans to Argentina's military junta which contributed to the country's default on $140 billion of borrowings this year. 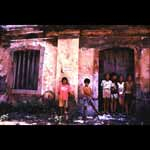 Loans for corrupt projects in the Philippines during the presidency of Ferdinand Marcos, debts incurred in 32 years of Suharto rule in Indonesia, Yugoslav debts related to Slobodan Milosevic, and debts owed by the Democratic Republic of Congo for Zairean dictator Mobutu Sese Seko might all be classified "odious." "I would not be surprised to see half developing countries' debt being classified as questionable," said debt campaigner Joseph Hanlon who is writing a paper on the subject for a Norwegian church group. The campaign, which will link pressure groups in poor and rich countries, aims to build on the success of the Jubilee movement which put tens of thousands of people on the streets and in just five years pushed debt relief to the top of the political agenda. Crucially, this campaign will target private bank lending by arguing that many banks failed to observe prudential rules they would use in rich nations and pushed loans on poor countries and were either fully aware of the end uses of those loans or wilfully negligent not finding out their use. A study by the Center for International Sustainable Development Law at Canada's McGill University for Canadian churches defines odious debts as "those contracted against the interests of the population of a state, without its consent and with the full awareness of the creditor." Campaigners like Hanlon argue that private banks have continued to benefit from debt repayments and that it is only fair that they bear their share of debt relief. "What we have is international socialism for the banks and capitalism for everyone else," Hanlon said. A prudential system will help both sides, campaigners say, and unlike the "Drop the Debt" campaign fronted by Bono will avoid the problem of countries being labelled deadbeats for repudiating debts by making the role of the banks explicit. "If the banks are let off the hook, they will do it again," said Patricia Adams of the Canadian advocacy group Probe International. The main problem for the debt campaigners is that few countries have been willing to make use of the Cuban precedent because of concerns that they would be cut off from aid and investment. From 1985 to 1995, the height of the Latin American debt crisis there were no international arbitrations involving the enforcement of a loan of a less developed country debtor and a creditor government or private bank. The McGill study does cite some potential precedents which could be used should a country be willing to take the issue to a court or tribunal. In 1917, a British court ruled that Costa Rica was not liable for loans made by Royal Bank of Canada for debts incurred by dictator Frederico Tinoco which were used for his personal gain. There is also a post-World War One ruling that Poland was not liable to repay bonds issued by Germany which were used to forcibly purchase Polish land for German settlement. The Soviet Union repudiated, and has not settled, Tsarist era debts, but surprisingly few countries have taken this route, preferring instead to keep on good terms with financial markets and bodies such as the World Bank. Crucially for the campaigners, there are moves at the International Monetary Fund to reform the global financial system. The IMF has put forward proposals for an international bankruptcy system, a revolutionary move which would allow countries to seek protection from creditors in the same way that companies can. A recent paper presented by two Harvard academics at an IMF seminar brought up the issue of odious debts and suggested that future bank lending could be influenced if there were a risk that a country's government could be declared odious. Professor Michael Kremer and graduate student Seema Jayachandran argued that banks would be much more prudent if they knew there was a risk that a government could be declared odious and that a successor regime could repudiate illegitimate debts. "In fact this sanction works precisely by eliminating the existing incentive of creditors to collude with dictators and issue loans that help the dictator and themselves at the expense of the people; even unscrupulous creditors will abide by this sanction," they said. International Court of Justice to action via the domestic courts of borrower countries or courts in New York or London whose laws govern many loan and bond contracts. For the debt activists, the key issue is that the perceived legitimacy of the concept of odious debts is raised, rather than the legal status of each debt. Kremer and Jayachandran believe their approach would at least offer the banks some protection as it could head off the more radical approach of some debt campaigners. "It could potentially make banks better off. Right now banks run the risk of thinking a government is legitimate and then 10 years from now there could be a campaign to declare it illegitimate which means they could lose all," Kremer said. ROCK legend Bono has urged EU leaders meeting at the Laeken summit not to allow "narrow law and order concerns" to obscure the need for them to tackle the global poverty which provides a fertile breeding ground for terrorists. In an exclusive interview with European Voice, the U2 frontman and drop- the-debt campaigner called on Europe's governments to back UK Chancellor of the Exchequer Gordon Brown's call for the creation of a 56-billion euro international development fund. "We should really gather around Gordon Brown's proposal because it has numbers," said the Irishman, named European of the Year at last week's EV50 awards ceremony. "It's not just rhetoric, it's an actual plan." Bono said Commission chief Romano Prodi, Lionel Jospin, Tony Blair and Gerhard Schroder all "have the will" to improve the lot of the world's poorest people and urged them to "really do something that history might remember". While the discussions on combating terrorism at Laeken will concentrate on security issues such as the proposed European arrest warrant, Bono argues that this should not be allowed overshadow the need to fight poverty. "At the start of the 21st century, it might be the right time to put a relationship that is so wrong to right between the developed and the developing world. That might be the only fitting memorial for the lives that were lost on September 11 - that the world would not be just a less dangerous place but a fairer, more inclusive place. "As well as having a moral force, the argument has a strategic sense about it," he said. "[US Secretary of State] Colin Powell was the first person to describe HIV/AIDS as a security issue for the United States - and that was way before 11 September. Any reasonable mind who studied the issues must concede that someone who has no hope and has nothing to lose is easy prey for al Qaeda and the like. "If you go to Botswana and sit in a crowded bar or market place and you realise 35% of the people in this crowd are HIV positive and that none of them will have access to anti-retroviral drugs simply because of their geographical location or the colour of their skin, you could understand how such a death sentence - which HIV is on the continent of Africa - could make a militant into a terrorist." The Jubilee campaign which Bono fronts has recently widened its focus beyond debt relief to also call for fairer trade and increased development aid. "It's inexcusable that the great exponents of free trade are themselves not allowing the poorest of the poorest countries to sell them their ground nuts or coffee or cocoa beans," he commented. While several EU leaders have been happy to have their photographs taken with the man who penned such chart hits as Pride (In the Name of Love) and Beautiful Day, his campaign has drawn criticism from development chief Poul Nielson. The Danish commissioner has dismissed Jubilee's reservations about the highly-indebted poor countries (HIPC) initiative, which sets conditions under which debt relief can be granted. Earlier this year, Nielson described the scheme, designed by the World Bank and International Monetary Fund, as "the greatest show in town in terms of poverty reduction". Bono claimed that if the HIPC was effective it could make a significant difference for debt-ridden economies. But "what happened with HIPC was that after three years only one country had reached completion point [on debt relief]. "Most of the HIPC countries were still spending more serving their debts than on health and education. This was totally unacceptable and we had to criticise the process," he said. PHILADELPHIA (Reuters) - It's 5:00 p.m. on a Friday and a man looking rather like a motorcyclist from the future is sitting in a hotel lobby soothing a cough with a cup of black coffee. Over the last two hours, he has met with Algerian President Abdelaziz Bouteflika, the Ivory Coast's prime minister, Affi N'Guessan, and Ambassador Mamadou Seck of Senegal. Upstairs, a summit on U.S.-African trade upstairs is winding down. Following Live Aid, Bono and his wife Ali worked at an Ethiopian relief camp for a month. Activism helps him remember. 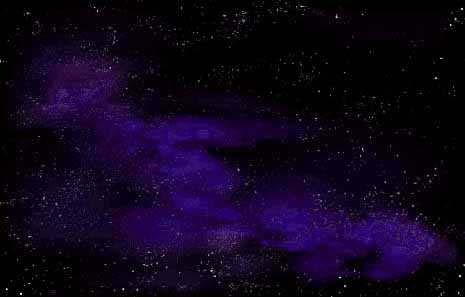 ''We had experiences there that you could never forget,'' he said. ``But you go back to work and your life and you do forget.'' Remembering brings him to lobby world leaders. 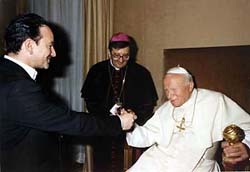 Pope John Paul II donned the singer's sunglasses during a 1999 meeting. At a gathering of finance ministers in Washington, Bono grabbed the mike and crooned, ``Well it's one for the money,'' the opening of ``Blue Suede Shoes,'' the song Elvis Presley made famous. In Philadelphia, Bono wore light blue spectacles and black from top to his spongy shoes. ``I don't have to be formal, I can just be who I am because I represent a rather informal collective,'' he said. Informalities aside, Bono targets the most serious of issues. Drop the Debt calculates that African countries spend around $13.5 billion a year repaying debts to rich countries, more than double what they spend on health care and as much as they need to effectively combat the AIDS pandemic sweeping the continent. Sub-Saharan Africa owes Western banks more than $200 billion, according to the International Monetary Fund . That's dangerous, especially in a post-Sept. 11 world, Bono said. 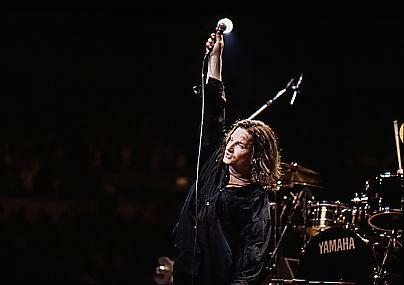 ``We've just seen in a torturous way what happens when one country, like Afghanistan , is left to implode,'' Bono said. ``God help us if the (sub-Saharan) continent of Africa is left to follow its present trajectory -- which is 40 million AIDS orphans in the next 10 years,'' he said, citing U.S. Agency for International Development figures. Realizing the complexity of African poverty, Drop the Debt is expanding its agenda to include AIDS, trade and intellectual property issues. Drop the Debt and AIDS groups set up booths at U2's shows and fans send 2,000 letters a week to the White House calling for debt relief, aid and trade for Africa, said Jamie Drummond, global campaign director of Oxfam, a British relief organization, and a friend of Bono. In 1996, the World Bank and International Monetary Fund identified countries eligible for easing of debt under their Highly Indebted Poor Countries program. Drop the Debt aims to speed the process along. So far, three countries -- Uganda, Mozambique and Bolivia --have qualified for full debt relief and 20 others are in various stages of completion. Drop the Debt's members also listen to the ideas of African leaders, especially the New African Initiative (NAI), which has been the talk of the summit in Philadelphia. ``We lobby African leaders as much as the G8,'' said Drummond. South African President Thabo Mbeki, Nigeria's Olusegun Obasanjo, Senegal's Abdoulaye Wade, and Bouteflik modeled NAI on the U.S. Marshall Plan that helped get Europe back on its feet after World War Two. It plans to tackle debt and AIDS with help from wealthy nations. British Prime Minister Tony Blair and German Chancellor Gerhard Schroeder have backed NAI's blueprint. Bono hopes the G8 group of wealthy nations agrees to a comprehensive package of aid to Africa by summer 2002, their next meeting, to be held in Canada. In the end, Bono said, debt cancellation is not the only answer. 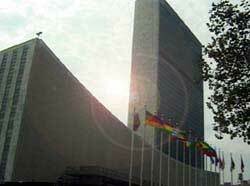 ``We need to let the poorest nations in the world trade with us,'' Bono said. With that he was off for a sound check at the First Union Center before U2 played for 21,000 fans. "Before going to Africa I knew a bit about the debt burden but I was staggered by how the massive amount of what to be paid back affects people. It's just insane. There are kids starving to death and countries aren't allowed to support their people because they're too busy selling crops to earn money to pay us back - and we don't even need it!" Africa's economic development in the new millennium has been dominated by the debt crisis. Foreign indebtedness now poses a fatal impediment to Africa's development and the future prospects for many countries are daunting. At the end of 1998, annual debt service payments from Sub Saharan Africa, the world's poorest region, to the richest countries amounted to $15.2 billion or 15% of exports. The total debt currently stands at $231 billion. Kofi Anan Video still by Alan Geoghegan	 United Nations Secretary General, Kofi Annan highlighted the seriousness of Africa's debt crisis in a recent letter to the industrialized countries. He pointed out that in many countries, up to 40% of government revenue was now being allocated to servicing foreign debts to the detriment of health, education and other essential social services. He warned that if the escalating debt crisis was not speedily resolved, the determination of the UN and the international community to half world poverty by 2005 would become a pipe dream. The United Nations has also revealed that worldwide 11 million children under the age of five died in 1998, most from preventable causes. World debt and the policies applied with respect to it are a major factor in these deaths. The Eye of The Needle goes to press at the end of a year of unprecedented pressure on the rich creditor countries to provide effective leadership on the debt crisis. The expectations around HIPC2, the international mechanism for giving debt relief to poor countries, have failed to not materialise, with as little as $12 billion delivered out of a pledge of $100 billion. This is at a time of unprecedented accumulation of wealth and riches in the west. Jubilee 2000's report, Shadowy Figures, shows that the IMF, the World Bank, the Inter -American Development Bank and the Asian Development Bank can all write off 100% of the debts owed to them by all HIPC countries, and all bar the World Bank could finance this write -off from their own resources. The African Development Bank could realistically afford to draw on up to $1 billion of its own resources without impairing its credit rating. Why there has so far not been an effective response to the continent's predicament, in the face of the escalating health and social crisis in many countries is one of the critical questions facing the international community today. The Eye of the Needle provides essential profiles on the most indebted countries in Africa and shows the consequences of the debt burden on the continent's social and economic development. The statistics are the most up to date and provided on a country by country basis. They make it clear that the resolution of the debt crisis is critical to lifting Africa out of economic stagnation and unleashing the great potential of its people. For every $1 received in aid grants in 1999, Sub Saharan Africa paid back $1.51 in debt service. Sub Saharan Africa owes $231 billion to creditors, that is $406 for every man, woman and child in Africa. Sub Saharan Africa bears 9 per cent of the developing world's debts, but has only 5 per cent of the developing world's income. Since 1996, Sub Saharan Africa has paid the IMF $1.2 billion more than it has received from the IMF. In 1999, Sub Saharan Africa paid $15.2 billion in debt service. This works out at $42 million a day. Sub Saharan Africa spends over twice as much on debt service as on basic health care. 7. Sub Saharan Africa spends 6.1 % of GNP on education and spent 5.0 % of GNP on debt service. Since 1990 debt service has risen from $10.9 billion to $15.2 billion, a rise of 39 per cent. Sub Saharan Africa's terms of trade has worsened steadily since 1980, as commodity prices have fallen. The effect is to make SSA 40 per cent worse off in terms of its trade relations with the rest of the world. If Africa's export prices had kept pace with import prices since 1980, Africa could have repaid its debt twice over. wealthy countries to forgive impoverished countries' debts. WASHINGTON--Old as the Bible yet with a modern twist, the idea was simple, outlandish, ambitious in the absurd: The world's richest countries should forgive many billions of dollars of debt owed them by the world's poorest countries--with a deadline of the dawning millennium. The unlikely assortment of true believers included a British professor whomoonlights as a peacekeeper for an African tribe, an Irish rock superstar, the pope, atarnished president in search of redemption, a Los Angeles member of the Kennedy clan, adevoted cadre of conservatives and a global flock of activists who equated modern debtwith ancient slavery. Blocking the way: many of the world's political and financial leaders, buttressed by apathy and time-honored beliefs that debts should be repaid. Yet in November, in a moment of rare triumph, champions of the quest known as Jubilee 2000 gathered in the White House to celebrate America's latest, $435-million installment on a global effort to help wipe out as much as $90 billion in debt owed by more than 30 countries. "It was a fluke--or a mercy of God--that it happened,"
said Martin Dent, 75, a retiredprofessor who envisioned the jubilee movement 10 years ago at a pub in Oxford, England. The world's wealthiest industrial democracies, ultimately pushed by the UnitedStates,had reversed course and embraced a coordinated, long-term strategy to reduce thedebts of he poorest countries, a goal long opposed by financial leaders. As part of the plan, theInternational Monetary Fund and theWorld Bank scrapped their own slow-moving debt-relief efforts and eased payment demands on 22 nations. Not that it happened easily. In the badly split U.S. Congress, debt relief wasbranded as aliberal, Democratic cause. In the end, however, partisan stereotypes wereshattered.Republican Sen. Jesse Helms of North Carolina became teary-eyed in a meetingwith U2'slead singer, Bono. Rep. John R. Kasich (R-Ohio), chairman of the House BudgetCommittee, defused concerns of GOP leaders. The foreign debt of the Philippines has risen steadily for the last decade and reached nearly $48 billion in 1998. Estimates suggest that this total had increased to more than $52 billion by June 2000. Almost half the long-term public debt is owed to bilateral creditors, of which thelargest proportion of $11.6 billion was owed to Japan in 1998. A quarter of the long-term public debt is due to multilateral creditors, mainly the World Bank and IMF, and the remaining quarter is owed to private creditors. There is also substantial long-term debt owed by private companies in the Philippines, this amounted to almost $11 billion in 1998. Short-term debt accounts for around 15 per cent of the total debt. Debt has been a major burden on the country for many years. Since 1992 debt service payments have exceeded $4 billion per year, with the figure for 1998 standing at $5.1 billion. The government is spending more on debt payments than on health and education combined and for every dollar received in aid grants $28 is spent on servicing the country's debt. The concept of odious debt is widely recognised as being relevant for the Philippines. Both NGO'S and World Bank officials acknowledge that a large proportion of the country's debt was accrued under the Marcos dictatorship. The Philippines is not included amongst the 41 countries listed in the HIPC programme. However the country's economy is being monitored by the IMF to assess whether the government have complied with agreed economic and financial policies. 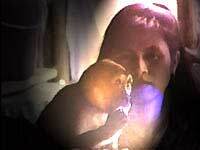 November 7, 2000 From the BBC It's a Beautiful Day! 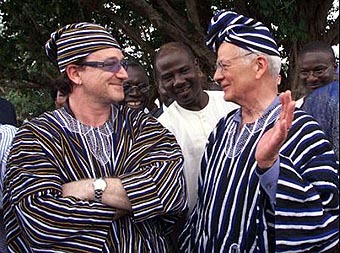 Outgoing US President Bill Clinton has praised U2 singer Bono for keeping the issue of third world debt n the headlines. The president thanked the performer as he signed legislation providing $435m (304m pounds) in debt relief to 33 of the world's poorest countries. Mr Clinton thanked campaigners for bringing the campaign to the attention of the world, including Pope John Paul II's call for debt forgiveness, and Bono's publicity efforts. "When we get the Pope and the pop stars all singing on the same sheet of music, our voices do carry to the heavens," he said. Mr Clinton said that Bono's "passionate devotion" had brought together politicians of different persuations. "Global poverty is a moral affront, and confronting the challenge is simply the right thing to do," he told the audience at a White House ceremony. 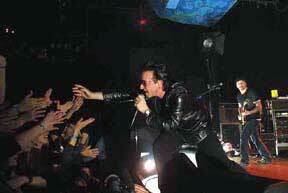 Bono has been involved with causes to help impoverished nations since the days of Band Aid and Live Aid. In the past two years he has met the Pope and the head of the World Bank, James Wolfenshohn, as part of his work for debt relief pressure group Jubilee 2000. The legislation signed by Mr Clinton is part of an international plan endorsed by the G7 group of nations last year. It aims to wipe out $90bn of debt owed by the world's poorest nations, reducing the total to about $37bn. The relief is given on the condition that the savings are used on projects such as education and healthcare, and the recipients do not engage in military conflict. WASHINGTON - Congressional leaders agreed yesterday to a plan to write off loans to 30 of the world's poorest countries, fulfilling a pledge by the United States to help alleviate the often crippling debts that have hindered economic development in the Third World. The plan is part of a major foreign-aid package that will include the full $435 million sought by President Clinton for Third World debt relief as well as language allowing the International Monetary Fund to release $800 million from the sale of its gold reserves for additional debt forgiveness. The debt-relief agreement should clear away one of the last major obstacles to Congress completing its work this week. The full House and Senate could take up the $14.9 billion foreign-aid package today. President Clinton is expected to sign the bill. The package would lift restrictions on aid to international family-planning groups that advocate liberalized abortion laws. It also would provide $100 million in assistance to Serbia if officials there cooperate with an international criminal tribunal and meet other conditions. This marks the first tangible congressional step to recognize the new government in Yugoslavia. Clinton led an international effort to bail out debt-laden Third World countries, on the theory that it would relieve them of interest payments that otherwise might go for education and other initiatives to help their economies. But until now he has been unable to persuade skeptical U.S. lawmakers to go along. A key factor in changing the situation was pressure from an eclectic coalition that includes Pope John Paul II,Nobel Prize-winning economists and singer Bono of the rock group U2. 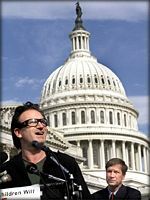 Sept. 22; U2 frontman Bono was in Washington, D.C., on Thursday, at a news conference on the steps of the U.S. Congress, appealing to the government to increase the amount of debt relief provided to impoverished nations. The singer, a key proponent of the Jubilee 2000 campaign, which encourages the world's wealthiest nations to drop dept owed to them by Third World countries, was accompanied by U.S. Treasury Secretary Lawrence Summers and others, including Republican Sen. Orrin Hatch. The Clinton administration has requested Congress to authorize payment of $435 million over two years to pay the United States' share of the Heavily Indebted Poor Countries Initiative, which aims to ease or forgive the crippling debt burdens of some of the poorest nations. However, the House of Representatives and the Senate both have balked at appropriating the full amount. Instead, the House has set aside some $225 million and the Senate just $75 million in two different versions of foreign aid bills that have yet to be reconciled. While Bono told the assembled that he was encouraged by the support he had seen in Washington, he voiced concerns about Congress actually coughing up the requisite dough. "It's hard to get people in this town to agree on anything, and yet people have really come together on this," he said. "But until I see the $435 million, I'm going to be a bit skeptical." it's exciting." The band, which releases its new album, All That You Can't Leave Behind, on Oct. 31, is still finalizing plans for an upcoming world tour. On Sept. 7, the Irish rock star delivered a petition with more than 21 million names &emdash; including the Dalai Lama, Bishop Desmond Tutu, Muhammad Ali, and David Bowie &emdash; to the United Nations Millennium Summit, urging them to cancel Third World debt. "It's madness that a pop star has to be standing here," he noted of his involvement in the cause after handing in the petition. "Somebody else should be doing this, somebody else more qualified. But you know what? They don't have time. They're not bad guys in Washington, they're just busy guys." U2's Bono joined a sea of protesters and politicians overnight at the United Nations in New York calling for the world's wealthiest countries to forgive the hundreds of billions of dollars of debt saddling the most destitute nations. 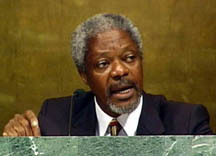 The two men presented Secretary-General Kofi Annan with a petition signed by 21.2 million people from more than 155 countries. The United States has balked at the calls for debt relief and tariff reductions for poor countries. Other world leaders say they are willing to erase $US100 billion ($177 billion) worth of debt, but that still leaves $US250 billion that poor countries say they cannot repay. Nigeria alone owes $US30 billion in debt it says it can't make good on. 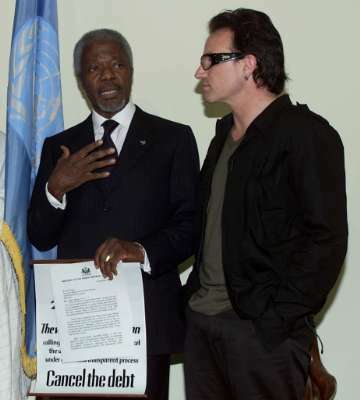 Annan thanked Bono and Obasanjo and said that the effort was a good example of common humanity and solidarity. The signatures were collected at churches and other organisations. 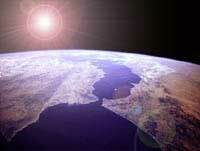 ``It's a new world government and we must understand that people out there want something done,'' Annan said. Kofi Anan & Bono,	United Nations NY (right) "Would you please take your hands out of your pockets!?" Bolivian campaigners have launched an unprecedented consultation exercise to get popular involvement in decisions on how resources released by debt cancellation are used. Working with the extensive networks of the Catholic Church, they have organised forums in 9 regions that will feed into a National Forum in La Paz on 24-28th April 2000. Bolivia was one of the first countries to receive debt relief under the agreement (HIPC 2) made by the G7 at their summit in Cologne. Bolivia's debt service payments were reduced from $329 million to $240 million. However this will still see Bolivia paying the equivalent of three-quarters of her health budget on debt servicing each year - in a country where 60% of the population do not have access to basic sanitation. "If this is all that is going to come out of HIPC 2, I do not understand the great declarations made in Cologne in June of last year," commented Archbishop Abastaflor of La Paz. However despite the failure of the creditors to live up to their rhetoric, the Bolivian campaign has demonstrated huge commitment to ensuring that the limited resources released are used to reduce poverty. Regional forums were launched in 9 regions in February that examined the key issues facing impoverished people in particular focusing on the issues of health, education, land and employment. Teams made up of representatives of organisations in the Jubilee 2000 campaign are now collating the conclusions of the regional forums which will be inputted into the National Forum in La Paz. They will then present a document to the Bolivian government which they are demanding is incorporated into the country's Poverty Reduction Strategy Paper - a paper that is required by the IMF as one of the conditions for debt relief.
" We are very aware of the problem of corruption and the lamentable fact that many external aid resources often never reach those to which they were destined. We are determined to ensure this does not happen" said Irene Tokarski of the Bolivian campaign. Sceptical that theBolivian Government will properly consult civil society and mindful of the fact that economicprogrammes adopted by the government have failed to reduce poverty, Bolivian debt campaigners decided to link up with the Catholic Church to consult and "seek a clear expression of what is needed from every social sector." "As far as we are concerned, it is an excellent opportunity to address the key issues that allow a majority of the population to carry on living in extreme poverty. Good analysis of the problems will allow us to re-examine the structure and approach of development programmes. This, of course, takes the campaign and the question of debt relief beyond a short term project and, instead, focuses profoundly on the long-term issues of efficiency and social control," said Tokarski. Ann Pettifor, Director of Jubilee 2000 Coalition in UK, said: "It is time the world's creditors, inparticular the G7, showed the same commitment to reducing poverty as ordinary people in Bolivia. Decisions about debt need to be taken out of the hands of bureaucrats inWashington and invested in ordinary people in indebted countries. That will provide the best long-term resolution to the debt crisis." THE Government must increase pressure on world powers to speed up the cancellation of Third World debt, marchers in Dublin urged yesterday. The Jubilee 2000 demonstration handed letters of protest to the embassies of the G8 countries, before delivering 18,000 messages to world leaders at the Japanese Embassy. After huge international pressure, led by U2 singer Bono and former Boomtown Rats front man Bob Geldof, world leaders promised at their 1999 summit in Cologne to cancel billions of dollars of debt. Politicians from the United States, Britain, France, Germany, Japan, Canada, Italy and Russia meet again in Japan next week, facing pressure from campaigners around the world, who claim very little has been done to honour last year's commitments. The G8 countries promised an awful lot in Cologne, but what has been delivered is peanuts. This protest is a reminder that we have not gone away, said Columban Missionaries priest, Fr Pat Raleigh. Just look at what happened in Manila this week, where 50 people died after a huge dump collapsed on slums. Those were people who had been moved from their localities, eking out an existence in sub human standards, said Fr Raleigh, who has served in the Philippines. A letter handed into the Taoiseach's office called on Irish politicians to do more to influence world leaders on the issue, and a Government spokesperson said the matter would be given consideration. The 18,000 signed postcards handed in at the Japanese Embassy yesterday called on G8 countries to cancel Third World debt, without any conditions which would affect citizens of poorer nations. Rome-At the end Italy reduces the debit of the poor countries. After a strong campaign leaded by Bono, after several appeals from the Pope and an increasing mobilitation, the Senate today said yes to the law that will erase in 3 years credits for 12.000 billions. They will be able to enjoy the benefits of the law the 62 Countries that receive financial facilities from IDA, the International Development Association. In particular the 41 Countries of multilateral initiative HIPC (Poor countries and highly indebted) will enjoy various conditions, times, facilities different from those accepted in multilateral negotiations between the Creditor countries. In the meantime the Developing Countries not related to IDA will be subjected to special conditions previously decided from multilateral negotiations. Therefore Italy " has made his part " said an happy Tana De Zulueta confirming a general satisfaction in the government. "From today we are all little more civil" has said the senator of Alleanza Nazionale, Riccardo Pedrizzi.
" The Italian Parliament has given a great demonstration of responsibility "
says the secretary of Democratici di Sinistra Walter Veltroni. A general satisfaction expressed also from the President Giuliano Amato that says thanks to the Senate. "Next week during the meeting of G7 in Okinawa Italy will present a good law on a priority matter, that's not only to erase the debt but to discuss an entire system of laws. It was an important appointment for the government and i'm very happy to see this positive conclusion that has arrived this morning in the Senate" says Amato. Get the latest: Dig into ONE's analysis on the hottest topics in global poverty policy.